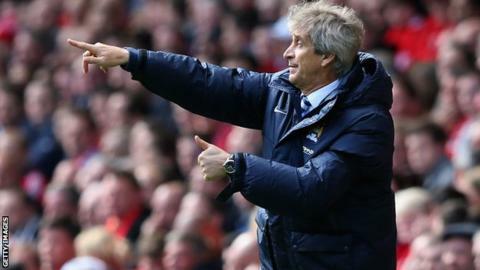 Manchester City boss Manuel Pellegrini says he has had "no complaints" from the club's owners, despite falling behind Liverpool in the title race. City are six points adrift of Liverpool and four behind second-placed Chelsea following last Sunday's 3-2 defeat at Anfield and Wednesday's 2-2 draw at home to Sunderland. City, in third, have five games left, while their rivals have four. "I never heard anything in terms of a complaint," Pellegrini said. "I am absolutely sure other teams will also drop points in the same way we did. "We have 15 more points to play for and we will try to win the most amount of points. Then at the end of the season, we will see who has the title." In his debut season as City manager, Pellegrini won the League Cup in March but slumped to home defeat against Wigan Athletic in the sixth round of the FA Cup one week later before losing to Barcelona in the Champions League last 16. City play at home to West Bromwich Albion on Easter Monday before travelling to Crystal Palace and Everton, then hosting Aston Villa and West Ham United in their final run of Premier League fixtures. Liverpool visit Norwich City on Sunday before taking on Chelsea at Anfield one week later. Liverpool, who are chasing a first league title since 1990, then travel to Palace before hosting Newcastle United on the final day of the season.